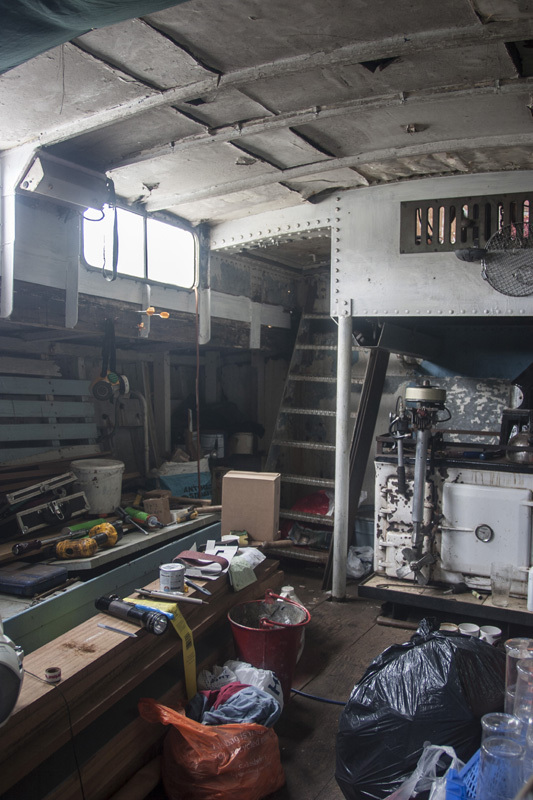 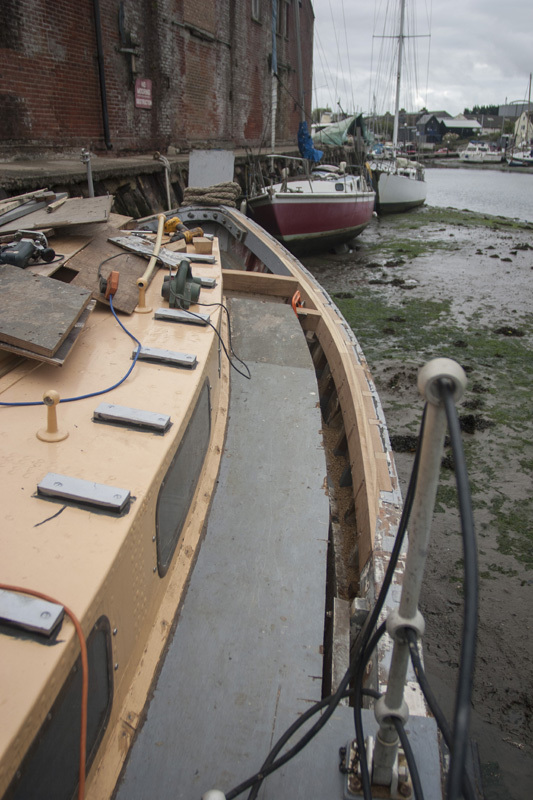 Having replaced the stem and satisfied myself that the underwater section of the hull was in good shape thought turned towards getting the large hole where the foredeck was supposed to be sorted. 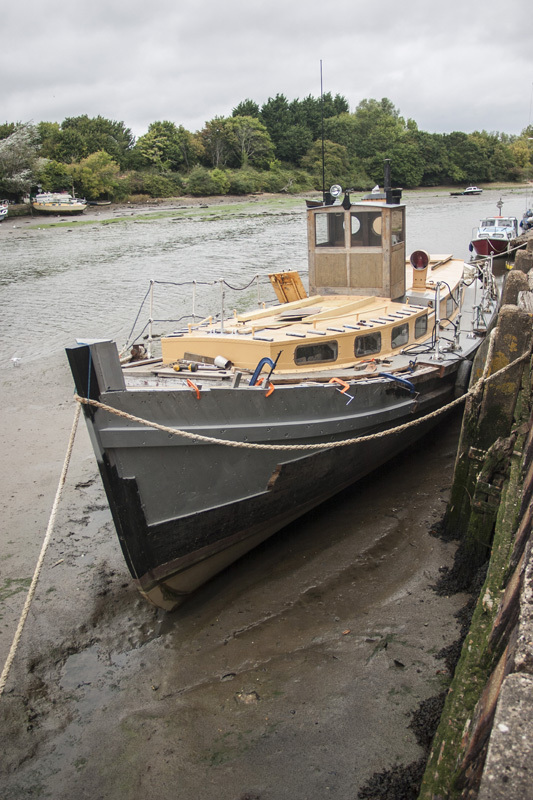 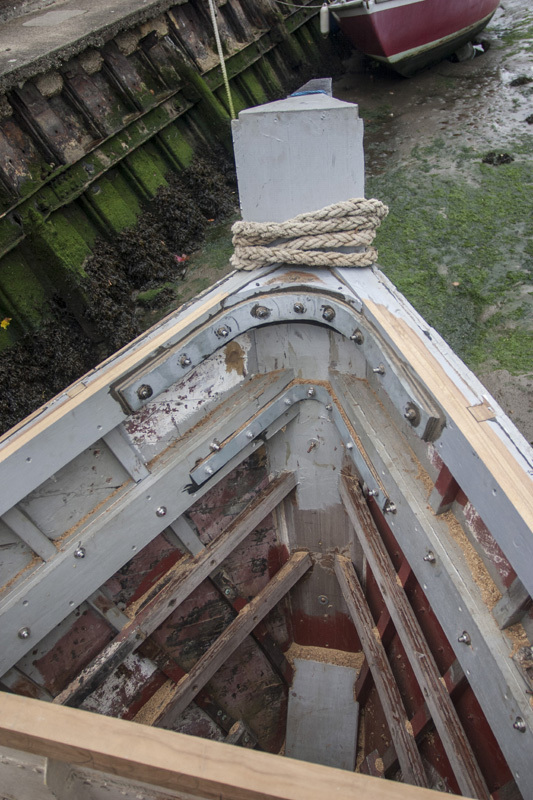 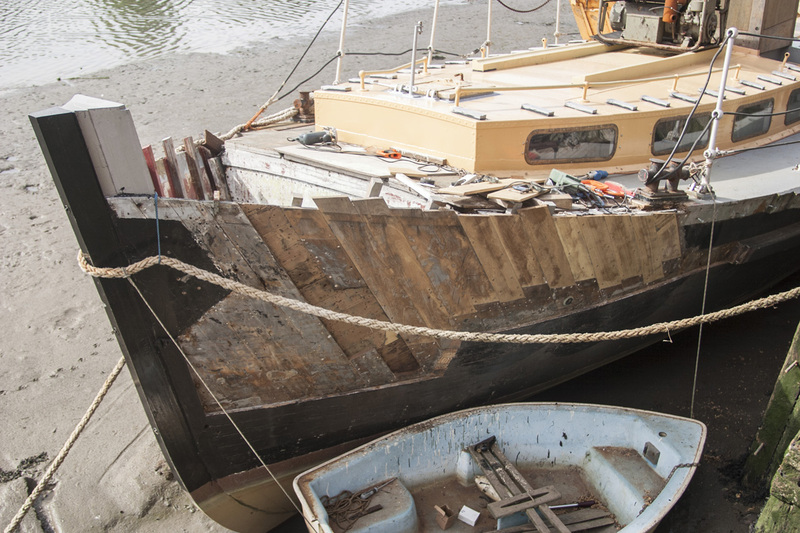 A section of the teak planking on the port bow had been replaced in the past with Iroko as part of what appears to be a very large accident repair. 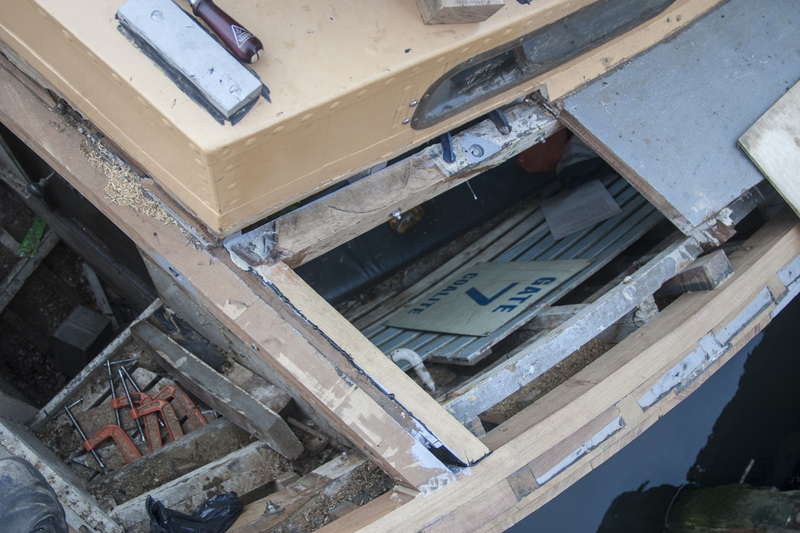 The badly replaced deck fitted in the 90′s had allowed freshwater to run into the end grain of this planking and caused a fair amount of rot. 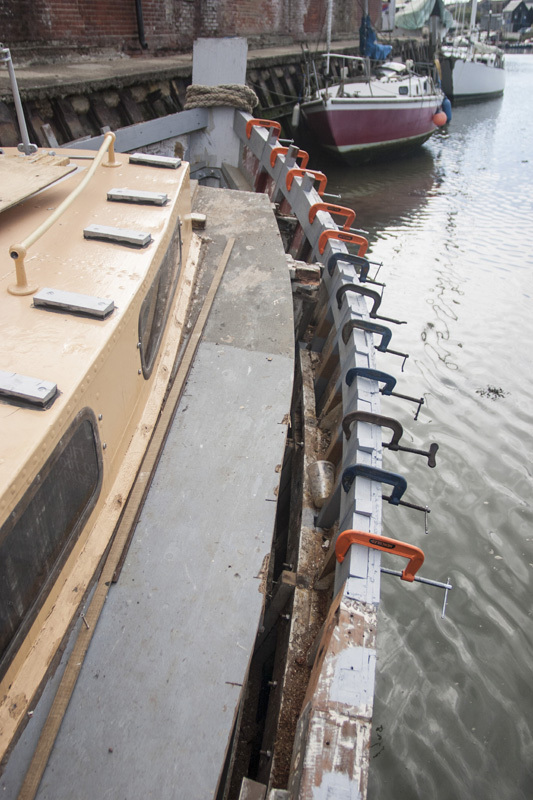 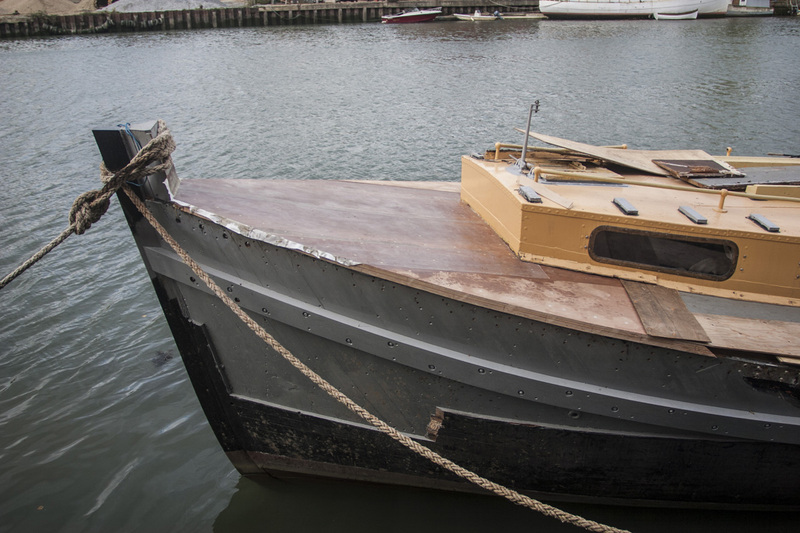 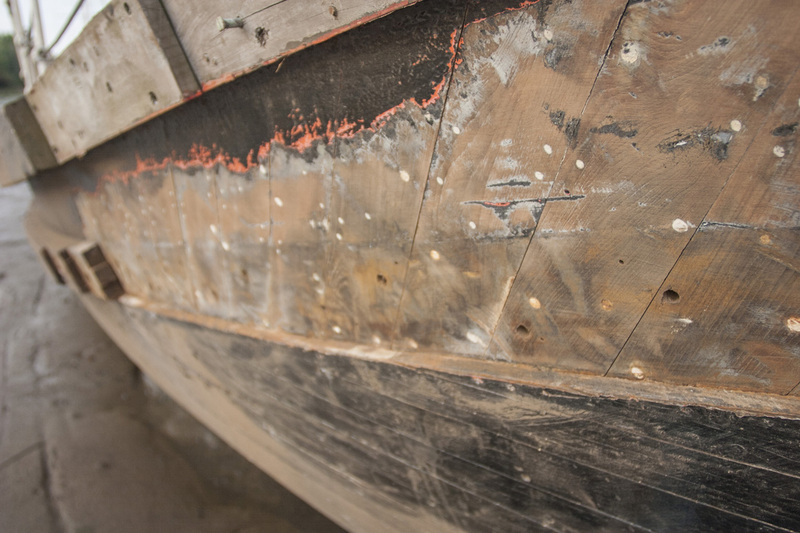 The hull itself is “double diagonal” construction with two layers of 15mm thick planking run at 90degrees to one another with calico inbetween, then fastened with thousands of copper rivets. 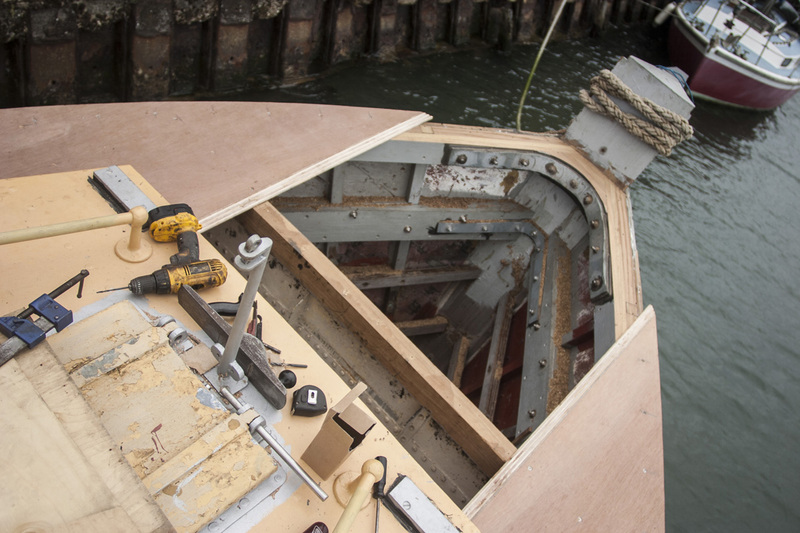 First the rubbing stake was replaced and through bolted in order to keep the shape of the hull when the deck and beamshelf are cut out. 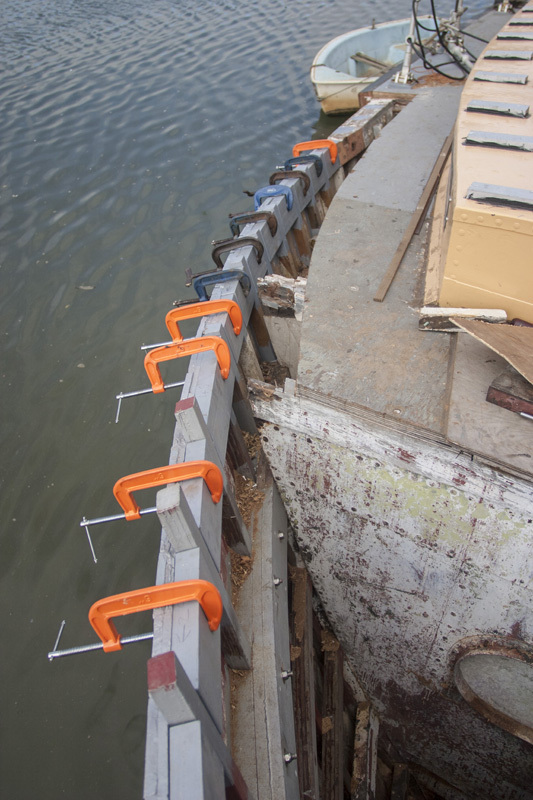 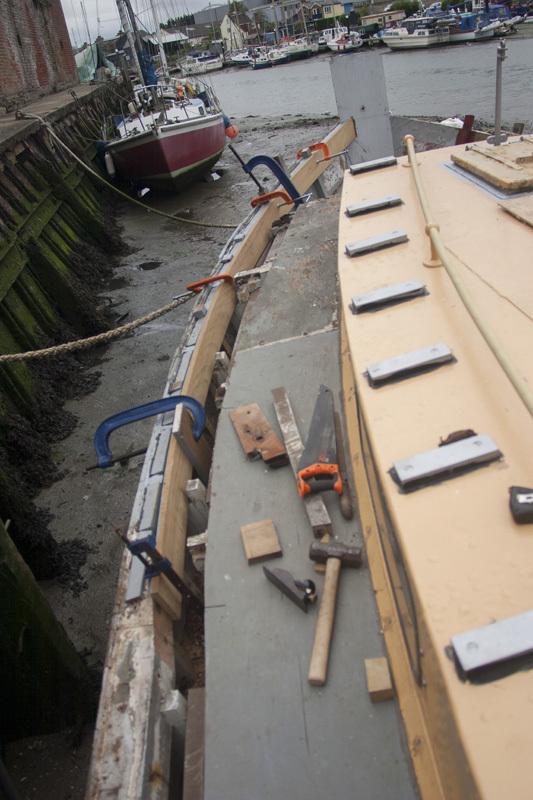 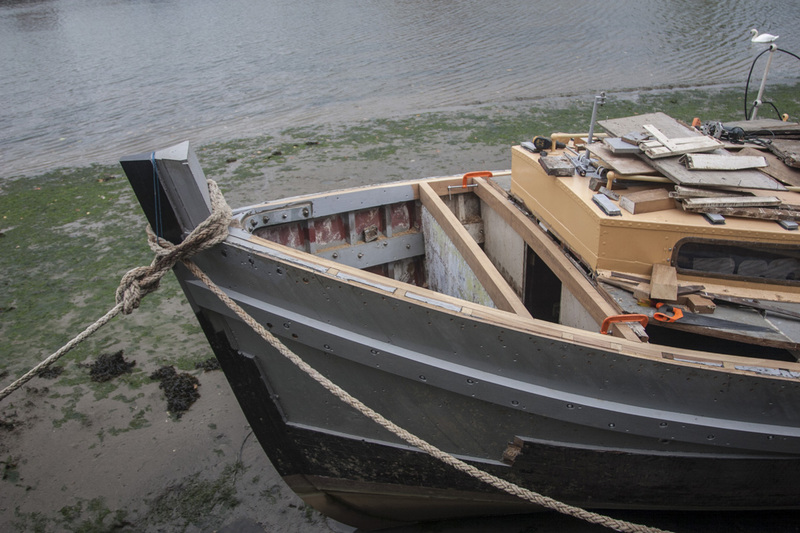 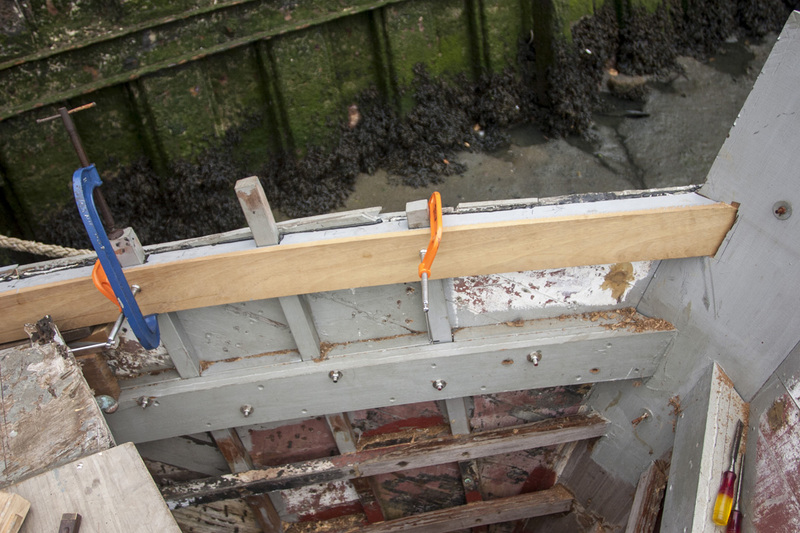 The hull planking is fairly flexible and its the frames, stringers etc that help it hold its shape. 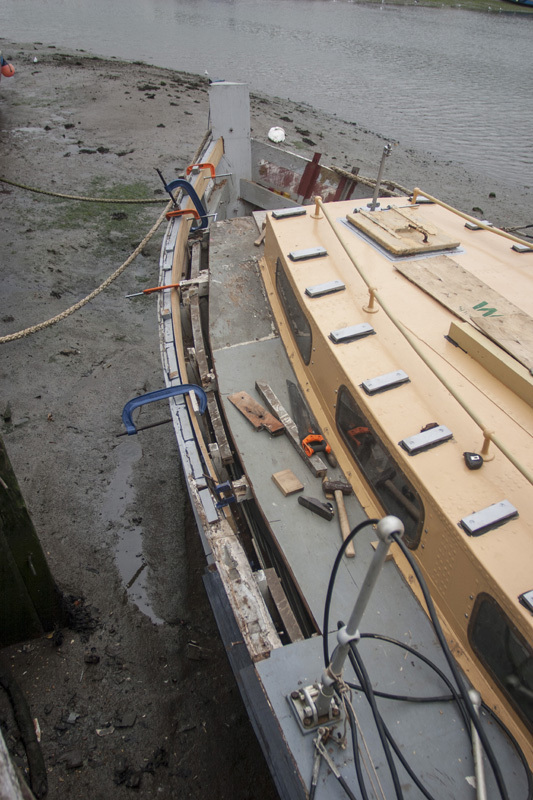 I’d got a very good deal on enough 2″ marine ply to replace pretty much all of the sidedecks at £50+vat a sheet as opposed to its list price of over £340 it was too good to miss!. 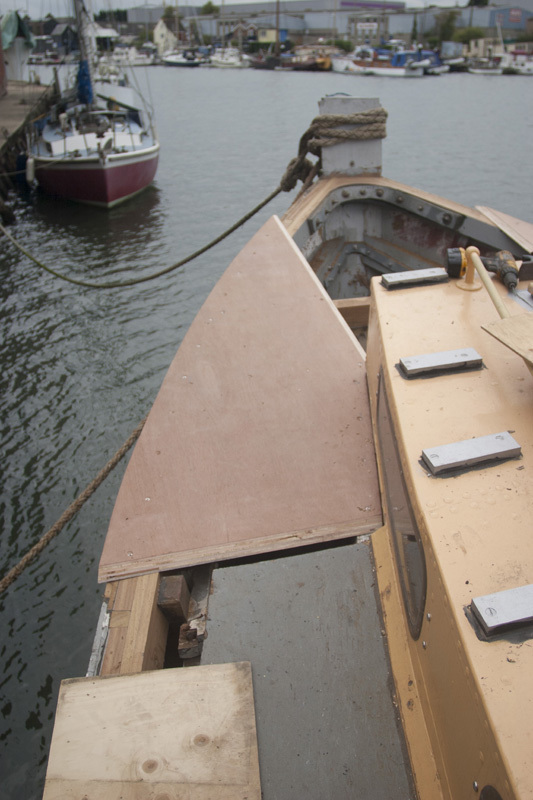 The foredeck and the very forward section of the sidedecks has quite a bit of camber (curve) as the 2″ ply is incredibly stiff (32 laminates of gaboon with less than 0.01% voids) I decided to laminate the foredeck out of two layers of inch ply. 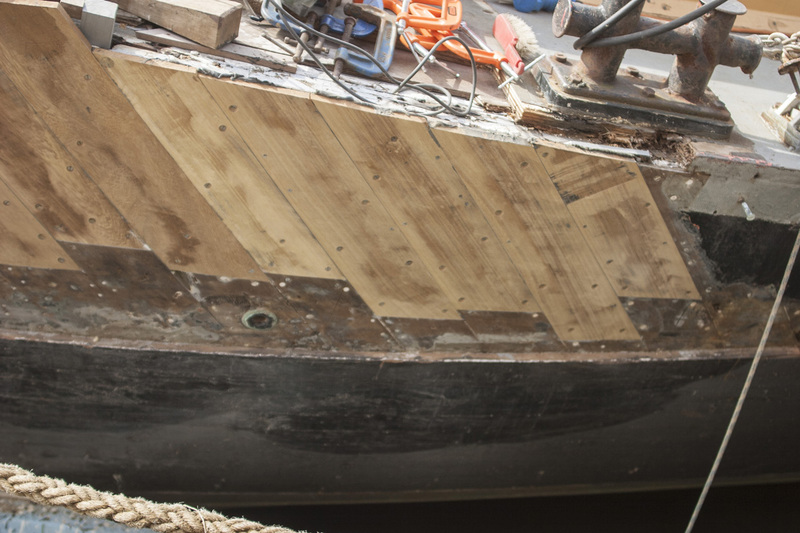 Better end this post here as its incredibly long!